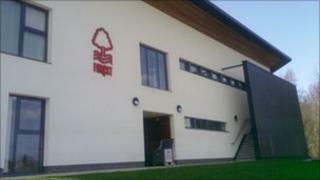 Nottingham Forest Football Club has opened a new state-of-the-art building, costing £1.5m, at their training ground in West Bridgford. It is hoped the two-storey complex, on Wilford Lane, will give the team the edge when it comes to playing matches. Finance director John Pelling said the facility was thanks to team manager Billy Davies and his meticulous approach to training. He added that it would take the club up a further level of professionalism. "This building is testament to his [Billy Davies] thinking, and we've tried to interpret it," said Mr Pelling. "We've tried to give our first team squad a home they can call their own as opposed to, as they've had to do up to now, sharing facilities with our academy." The building features ice baths, which aid recovery, a room with a large screen for watching previous matches and a new canteen. The facility also has an anti-gravity treadmill, in the gym, which will help injured players with their recuperation. The treadmill takes the weight of the player, taking stress off their damaged joints and muscles. Injured striker Dexter Blackstock has already been using the machine. There is a large changing room which allows the whole squad to stay together. Previously, the team changed in three different places.